0.5m Premium Certified HDMI Cable HDCP 2.2 Backwards Compatible With Version 2. - Premium Certified HDMI Cable HDCP 2.2, Hdmi Cables Same Day Dispatch On Our Leads If You Order Before 2pm Weekdays. 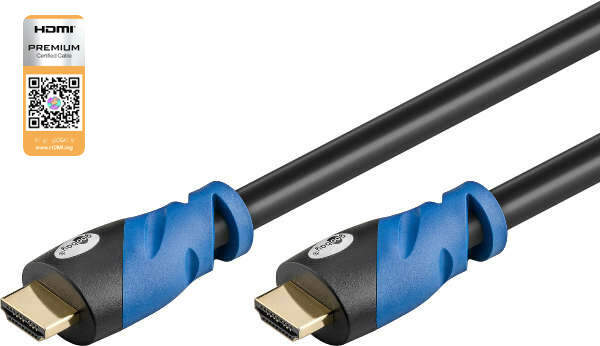 Premium HDMI Cables are relied upon for higher performance and value, and are the only cables to be tested and certified by HDMI Authorized Test Centers to ensure they support high-bandwidth HDMI 2.0b specification enabled features. Other lengths available click Premium Ceritified HDMI Cables on the left. Currently viewing: 0.5m Premium Certified HDMI Cable HDCP 2.2 Backwards Compatible With Version 2. - Premium Certified HDMI Cable HDCP 2.2, Hdmi Cables Same Day Dispatch On Our Leads If You Order Before 2pm Weekdays.